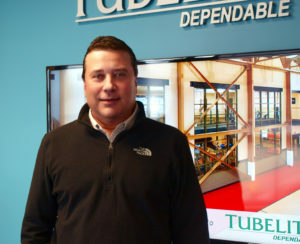 Tubelite Inc. has named Michael Distefano as client development manager serving the market in western and central Pennsylvania. He reports directly to Tubelite regional sales manager, Jim Oberlin. They work closely with glazing contractors and architectural teams to provide assistance with storefront, curtainwall, entrances and daylight control systems. Distefano started his career at McClure & McClure, Inc. as a field installer and was promoted throughout the next two decades before landing the position of president of the company. He continued his career as the owner of JLNMDISTE, LLC, a broker and consulting firm, and most recently held the position of sales representative and estimator at W.A. Wilson Glass Plus in Wheeling, West Virginia.